Like the American Curl breed, the Wirehair started as a spontaneous mutation in the domestic cat population. In 1966 breeder Joan O’Shea acquired from a small farm in upstate New York a kitten that was just a hair different. As a breeder of Rex breeds, O’Shea recognized that the scruffy-looking red and white bicolor male kitten might represent a new breed of cat. Council Rock Farm Adam of Hi-Fi the kitten’s given name was later bred to the neighbor’s straight-coated cat, which also had come from the farm. The breeding produced two more Wirehairs, which O’Shea bought and named Abby and Amy. O’Shea sold Amy to Rex Breeders Bill and Madeline Beck, who became instrumental in helping the breed achieve notice in the cat fancy. Amy gave birth to a number of Wirehairs, including a cat named Barberry Ellen, the first homozygous Wirehair to be born. In 1967 the Becks petitioned the CFA to accept Wirehairs for registration. The petition was granted. The breed went on to achieve CFA Championship status in 1978. Since the breed sprang from the domestic cat population, O’Shea felt that the standard should reflect the American Shorthair’s conformation with a specific standard written for the coat. Since then, the standards have changed slightly to reflect changes that appeared in subsequent litters. O’Shea stopped working with the breed around 1970; the Becks did not work with the breed for much longer, either. Since then, a handful of breeders, judges, and exhibitors have kept the Wirehair breed going, and have also worked to improve the original body style by selectively breeding for a more American Shorthair type. Currently, the numbers are limited. In 1995 only 74 Wirehairs were registered with the CFA. Waiting lists can be long and prices high. While the breed seems to be entirely “made in America”, research indicates that the mutation may have occurred before. Cats with coats similar to the Wirehair apparently were seen in derelict bomb sites in London after World War II. Two of these cats were apparently exhibited in the pet category at the National Cat Club show in Britain two years before the Wirehair cat appeared on the American scene. Whether the American Wirehair somehow comes from the same gene pool or if these were two similar spontaneous mutations that took place in two different areas of the world is something we may never know. American Wirehair cats are people cats that crave human attention and affection. They are active without being hyper and affectionate without being clingy. They exhibit a keen interest in their surroundings, want to be involved in every aspect of your day, and will follow you from room to room to keep an eye on proceedings. Fanciers say that they seem particularly in tune with their human’s feelings and try to offer comfort and companionship when their chosen humans are feeling blue. That’s when they turn on the purrs and sit beside them to offer their support. The coat differs from the Cornish Rex’s coat in that the Wirehair possesses all three hair types. Also, the American Wirehair cat gene is dominant, unlike the Cornish and the Devon Rex’s recessive genes. The Wirehair’s hairs are crimped, hooked, or bent, resulting in a dense, resilient coat that leads to ringlet formation rather than waves. Breeders sent British geneticist Roy Robinson samples of the hairs and he concluded that all three types of hairs (down, awn, and guard) are twisted. At present, significant variation exists in the texture and length of the individual coats. The most preferred coat is short, very dense, and coarse to the touch. 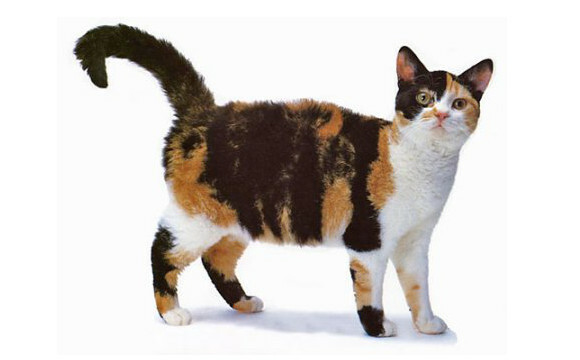 General: The dense, resilient coat distinguishes the American Wirehair cat from all other breeds. Body: Medium to large; back level, shoulders and hips same width, torso well-rounded. Head: Underlying bone structure round with prominent cheekbones and well-developed muzzle and chin; slight whisker break; in profile, the nose shows a gentle concave curve. Ears: Medium slightly rounded at tips, set wide and not unduly open at base. Eyes: Large, round, bright, and clear; set well apart; aperture has slight upward tilt. Color depends upon coat color. Tail: Tapering to a rounded tip. Coat: Springy, tight, medium in length; overall appearance of wiring and coarseness and resilience of the coat is more important than the crimping of each hair; very dense, resilient, crimped, and coarse coat is most desirable; whiskers should be curly. Color: Any color or pattern is acceptable except those that indicate hybridization, such as chocolate or lavender colors or the Himalayan pattern. Disqualify: Incorrect coat; kinked or abnormal tail; long or fluffy fur; evidence of hybridization.